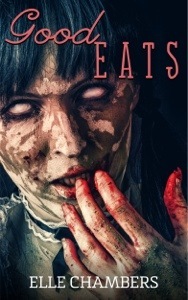 Good Eats by Elle Chambers out TODAY on Smashwords and Amazon! Good Eats, both the single and deluxe edition, are now live in the Amazon Kindle store! Get them now, and don’t forget to sign up for the Indie Spirit Press newsletter at the link on this blog’s sidebar for information on new releases from Elle and Amber. Elle – I’m sure this is a great novella. I know this from reading your previous work – both volumes of Dark Tales.